The event, which started as a one-off display for the new millennium in 2000, was funded by Cromer Town Council and was located on The Meadow – it was a success in terms of local support, and it raised a few hundred pounds for charity. Outgoing Firework Committee Chairman Jim Bond said: “This seemed to be an event that we could do every year, and the following year it attracted a larger crowd. After a few years, the display was moved onto the pier, thanks to North Norfolk District Council’s support. Since 2000 the event has given out grants totaling £55,815 to local charities and good causes. 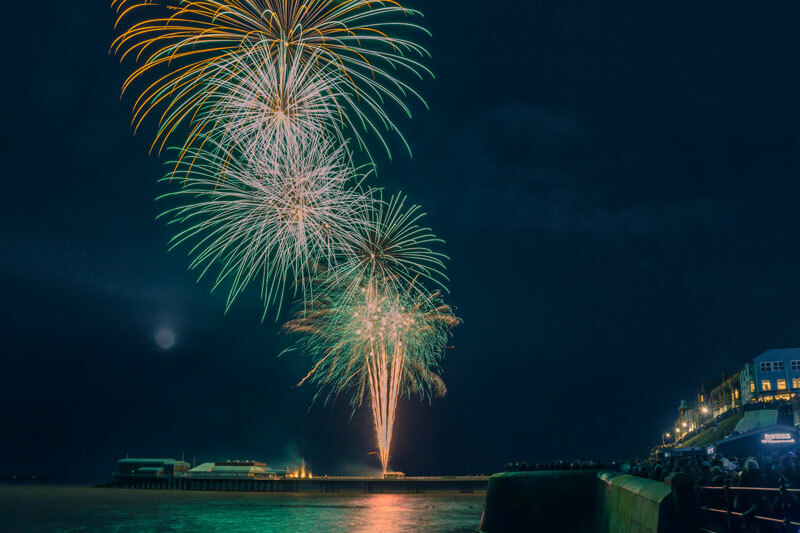 To mark the 20th display, organisers hope as many people as possible will again come to Cromer for the day to see more than 3,000 firework shots light up the skies over the North Sea. New Firework Committee Chairman Pat West said: “As always, the advice is please arrive early and support the local businesses in town who do support the Fireworks committee. “To mark the centenary of the end of the First World War we will have a red glittering firework leaf sequence which lasts about one minute before the main display. “There are also several exciting new sequences within the main display which will be new to Cromer this year and we are very excited to show these to everyone. “I’m also excited to announce the reintroduction of the torchlight parade from Cromer church before the display. We have a new route and for those who have purchased official merchandise there is a designated area with a grandstand view of the firework display. The annual display attracts more than 10,000 people into Cromer on New Year’s Day with many spending the day in the town for a breath of fresh air and something to eat and drink before the display is fired from Cromer Pier at 5pm. 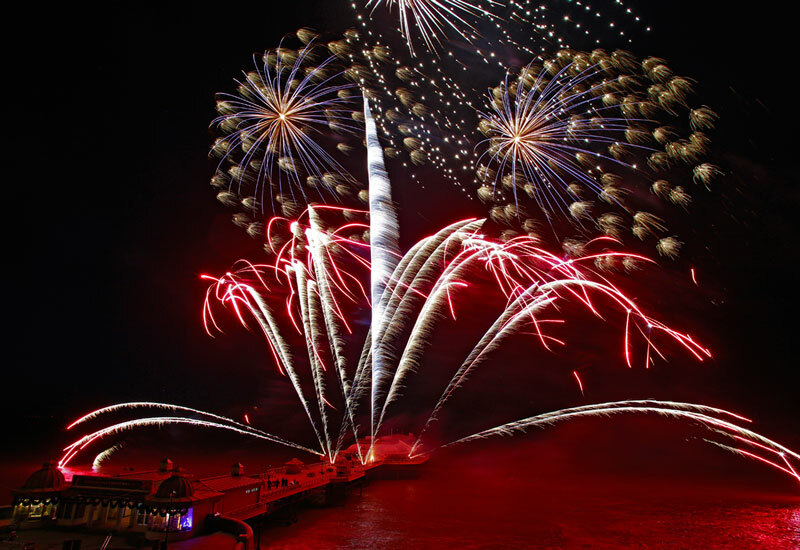 Will Evans, Project Manager at Titanium Fireworks, said: “Titanium Fireworks are delighted to be firing again off Cromer pier on New Year’s Day 2019. This show is now a firm highlight in our calendar and the crowds it draws, and money it raises for the community, make it something special for us to play our part in. “It has been decided that this year, to mark the centenary commemorations of the end of The Great War, we will initially fire a red falling leaves sequence to honour the fallen and light up the pier in red. This will be followed by a short moment of silence. “A local youngster called Maisy will then be leading the countdown as a thank you for the winning drawing she sent to the display organisers after the 2018 event and we will then start the main show and fill the skies above Cromer with an array of effects to wow the crowds and start the year with a bang. The event is free, however there will be bucket collectors out in force on the day to fundraise for the 2020 display. The bucket collection at the 2018 display raised a fantastic £10,021. Half of this was given out in grants to local good causes and the balance has been used towards funding the 2019 display. “Just a few coins can make a lot of difference to local charities and good causes – and withouteveryone’s help we couldn’t continue the annual display” said Jim Bond. Organisers are still looking for volunteers to bolster their official bucket collectors team. Please contact Cromer town council for more information or register at Cromer museum on NewYear’s Day from 2pm. Prior to the fireworks there will be a fun run along Cromer Promenade at 3pm organised by North Norfolk Beach Runners. The one-mile fun run is the perfect opportunity to work off those New Year’s Eve excesses with a gentle jog or a five minute dash if you’re up to it! from 2.30pm for a fee of £1. Illuminated merchandise available to buy during the afternoon outside Cromer Museum (next to the Church). Mulled wine will again be served outside the museum, with tea, coffee, and hot soup available in the church from 2pm – 4.30pm. The torchlit procession will set off from Cromer Museum at 4.30 pm, for those who have purchased official torches, to a viewing position on slopes in front of the Hotel de Paris. Local cafés, pubs, shops and restaurants will also be open and other vendors are planning toensure the crowds who descend on Cromer won’t go hungry. Visitors are urged to arrive in Cromer as early as possible on New Year’s Day. All three town car parks will be open. Runton Road car park will be charging a fixed charge of £5 per car for all day parking from 2pm on the day. Normal car park fees will apply on all other car parks. Additional car parking will be publicised in advance of the event. There will be no parking available on Cromer Promenade on New Year’s Day. Please note Cromer Pier will be closed from 8am on New Year’s Day until after the display (approximately 7pm) although Tides Restaurant will be open until 4pm. Please see Cromer Town Council website (www.cromer-tc.gov.uk), the event’s Facebookpage (‘New Year’s Day Fireworks, Cromer’) or Twitter feed (@NYDFireworks and @north_lodge) for updates. The day’s work starts at 8am on New Year’s Day when a team from Titanium Fireworks pull up at the Pier forecourt to unload the fireworks and doesn’t end until the counting of the bucket collection is complete, often not until 8pm. This year’s Cromer New Year’s Day firework display event costs over £9,800. Underwritten by Cromer Town Council, money raised from bucket collections will be divided between local good causes and funding for the 2020 display. This year there will again be a wheelchair viewing area at the top of the slopes outside the Hotel de Paris. This will be available on a first come, first served basis. There will also be a‘mobiloo’ located near the Tourist Information Centre off The Meadow car park. Titanium Fireworks have stressed absolutely no drones are to be flown during the event. It is currently illegal for drones to be flown over public land and near a crowd of more than 25 people without full insurance and a pilot’s license. Any drones flown near to/into the show may cause the show to end early so the team do not risk hitting the drone. To mark the 20th anniversary of Cromer’s New Year’s Day Fireworks there will be two firework photography competitions. The first, run by the committee, is once again sponsored by local electrical retailer Hughes, with the winner taking home a LG-43inch HD Led Smart Television this year. The second, sponsored by Titanium Fireworks offers the winner the chance to visit one of the group’s 2019 display for a behind the scenes tour. There will also be a picture competition for children to win the chance the press the button to start the 2020 Cromer New Year’s Day firework display.